A mental institution on an island is the backdrop for this creepy thriller as U.S. 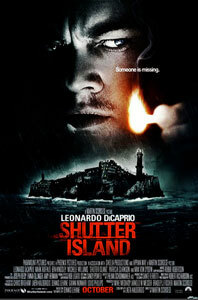 Marshal Teddy Daniels (DiCaprio) and his partner arrive to investigate a disappearance. The man in charge, Dr. Cawley (Kingsley) is distinctly evasive and there's a mysterious German doctor called Naehring (Von Sydow) whom WWII vet, Daniels takes an instant dislike to. The place is packed with psychotic killers but the men in charge seem to be up to no good as well. Could there be government experiments afoot with Nazi help? Scorsese does a great job of layering up the atmosphere as the script twists and turns its way through to an epic finale. Top quality production in every respect and kept me hooked throughout. It's not really an out and out horror film but there is plenty of horror here.